1. 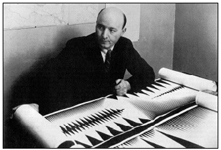 Data is Nature has links to interesting papers (in PDF and non-PDF form) on synthesthesia arts, including historical attempts to render sound waves as visual patterns (illustrated with gorgeous Deco drawings such as the one Oskar Fischinger is holding in a vintage photo) and a connection between Vasarely paintings and music. 2. Matt Stoller offers an interesting way to rebut arguments that "the free market is always right" (we know it isn't, hence McDonald's and Pixar movies). In his post he applies the economics of the "lemon theory" of used cars to some recent southern California legislation to ban fast food. The comments have rebuttals to his rebuttal. 3. Nice hiphop instrumental mp3 "Introducing...Intro" [link] from cratekings, recommended by disquiet. 4. For some reason Jed Clampett dances at half speed on Internet Explorer and normal speed on Firefox. We need some dance standards here.